This psalm is the second of the two by David in this book. It is a psalm of praise in which David himself looks back for comfort to creation and to the covenant given to Moses at Sinai. David reflects on the fleeting nature of human life and on the seriousness of sin. These two human problems lead him to think of the humble origins of man, who was made of the dust of the Earth, (v. 14). In the midst of human weakness, David finds in God’s revelation to Moses great comfort and encouragement as well as great stimulus to praise. The first verses (vv. 1-5) are a very personal hymn of praise that reviews the blessings of God to the psalmist. He calls on his soul to remember the benefits of God to him and then specifies five benefits from God: “who forgives all your iniquity, who heals all your diseases, who redeems your life from the pit, who crowns you with steadfast love and mercy, who satisfies you with good so that your youth is renewed like the eagle’s.” The psalmist celebrates health for body and soul, rescue from the grave to an abundant life, and profound personal fulfillment from the hand of God. God cares for our spiritual and physical needs. He raises us from the lowest to the highest. He gives us the best. Here, indeed, is reason for praise. At this point, we might compare these words of Psalm 103 with a popular praise song of our time, often presented as a setting of Psalm 103. The song goes: “Bless the Lord, O my soul, and all that is within me, bless his holy name. He has done great things; he has done great things; he has done great things. Bless his holy name.” The difference between this praise song and the actual psalm is striking. The song is repetitive in vague terms: He has done great things. The psalm, by contrast, is specific about the various blessings received. Taking the psalm as our standard of praise should warn us against the repetitiveness of many contemporary songs and lead us to praise that is much more pointed and specific. Genuine gratitude reviews in detail the wonderful gifts of our God. The psalm closes with verses of praise (vv. 22-22) that in some ways parallel the opening verses of praise, but have moved from a very personal and individual focus to one that is more universal. The angels who do his bidding in Heaven and all his works in creation are called upon to join the soul of the psalmist in praise. We are reminded again that the God who cares so personally and intimately for each of his own is the God who rules and directs all things. Between the opening and closing of the psalm in praise, the psalmist presents a wonderful meditation on the love of God. But he brackets that meditation with the discussion of God’s love with a confession of his universal dominion. The psalmist declares God’s universal care for the downtrodden: “The Lord works righteousness and justice for all who are oppressed,” (v. 6). He also declares God’s universal sovereignty: “The Lord has established his throne in the heavens, and his kingdom rules over all,” (v. 19). God’s care and his sovereignty illumine and undergird his love and call forth our praise. The central verses of this psalm (vv. 7-18) are one of the greatest reflections on the love and grace of God that we find anywhere in the Bible. This psalm has often been used by Reformed Christians as a communion song. As the Lord’s Table visibly shows the love and grace of God in Jesus’s death for sinners, so this psalm expresses audibly the truth of God’s great covenant mercies. To understand God’s love, David thinks back to a foundational moment in the covenant given to Moses. Moses had asked to see the glory of God and God passed before him, saying, “The Lord, the Lord, a God merciful and gracious, slow to anger, and abounding in steadfast love and faithfulness,” (Exodus 34:6). David remembers this marvelous revelation of the Lord and writes, “He made known his ways to Moses, his acts to the people of Israel. The Lord is merciful and gracious, slow to anger and abounding in steadfast love,” (Psalm 103:7-8). David has found comfort in the revelation of God’s love and mercy in his covenant. The psalm proceeds to relate the love of God first to the problem of human sin (vv. 9-13) and second to the problem of human frailty (vv. 14-18). In relation to sin, David tells us that the days of God’s accusation and anger against the sins of his people will end (v. 9). His mercy will be far beyond what we deserve (v. 10). Under the new covenant, we see how God showed mercy to his people without compromising his justice. Justice and mercy meet at the cross, where Jesus takes the anger of God that should have been visited on us and gives to us the righteousness and holiness that are his. God’s love and forgiving grace are described, remarkably, in spatial terms: “For as high as the heavens are above the Earth, so great is his steadfast love toward those who fear him; as far as the east is from the west, so far does he remove our transgressions from us,” (vv. 11-12). We join David’s praise to God for love of immeasurable height and for the removal of sins to an immeasurable distance. God’s immense love is not distant, however. It is not the benevolence of a distant sovereign or bureaucrat. It is the tender love of a father: “As a father shows compassion to his children, so the Lord shows compassion to those who fear him,” (v. 13). The love of God cares for us not only in our sinfulness, but also in our human frailty. Man who was created from the dust of the ground to bear the image of God, now is cursed to return to the dust: “For you are dust, and to dust you shall return,” (Genesis 3:19). But the God who cursed sinful mankind remembers who and what we are, (Psalm 103:14). The world does not remember the men who live and die in it: “As for man, his days are like grass; he flourishes like a flower of the field; for the wind passes over it, and it is gone, and its place knows it no more,” (vv. 15-16). But God does not forget as the world forgets. There seems to be a play on words in Hebrew about remembering in this psalm. The Hebrew verb “to remember” (zakar) is used in verse 14 of God who remembers our need and is used in verse 18 of God’s people who remember his covenant and their obligations. In verse 16, by contrast, the verb is nakar, referring to a place that does not know or remember. This word play underscores how God and his faithful people remember what the world forgets. While the world in a short time forgets those who pass through it, God remembers and is faithful with a love that has no time limits. Even as generation gives way to generation, the love of the Lord remains fixed upon his people: “But the steadfast love of the Lord is from everlasting to everlasting on those who fear him, and his righteousness to children’s children,” (v. 17). 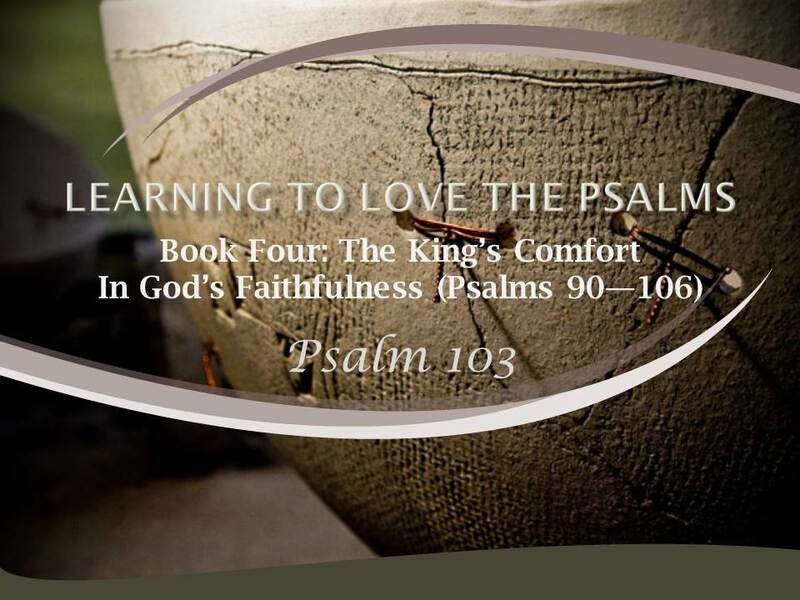 Psalm 103 does not present the great love of the Lord as a sentimental love that is indifferent to sin. The grace and mercy of God do not mean that God’s people may live as they please in sin. The psalm is clear: his love is “to those who keep his covenant and remember to do his commandments,” (v. 18). Those who have really received the grace of God come to love and fear him. They become eager to live faithfully before him. They do not ignore or despise his covenant but earnestly seek to live according to it. God is indeed most worthy of praise. He has forgiven and redeemed us in Jesus Christ. He has turned his anger from us. He promises us eternal life. And by his grace, he fills us with the desire to live faithfully before him. Praise the Lord, O my soul. What is the significance of the psalm’s beginning and ending with the words, “Bless the Lord, O my soul”? Genuine gratitude reviews in detail the wonderful gifts of our God. What specific gifts has God given you that brings you the most gratitude? Why are the central verses of this psalm considered to be one of the greatest reflections on the love and grace of God that we find anywhere in the Bible? If Psalm 103 does not present the great love of the Lord as a sentimental love that is indifferent to sin, how does it instead describe God’s grace and mercy? In what ways have you personally experienced the love of God in the midst of your sinfulness and human frailty?